NewSoil’s site is inspected and approved on a yearly basis by the NC Department of Environmental Quality, and is in total compliance with Section .1400 of the State’s Statutes, governing solid waste compost facilities . 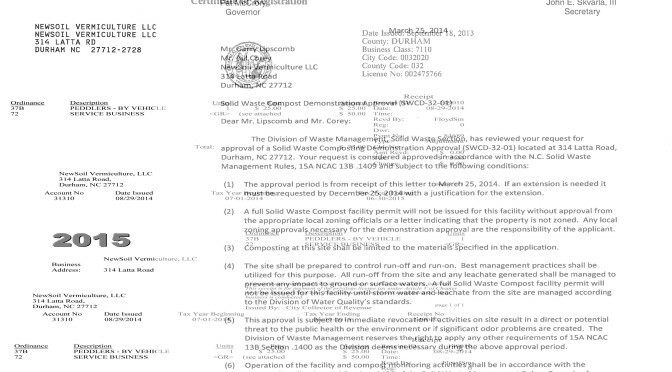 Our Small Type 3 Solid Waste Compost Facility is permitted (Permit No. 3216-COMPOST-2017), producing Grade A Compost. We are in the process of being certified as officially organic by the Organic Materials Review Institute (OMRI) at the Washington State Department of Agriculture , a three-year process. We soon will receive our STA (Seal of Testing Assurance) from the U.S. Composting Council.